Show that we care about the local communities in addition to caring for wildlife and habitat. Local communities often resent NGOs because they perceive them to care more for wildlife than people. Educate and teach practical methods to achieve conservation in harmony with community well-being. 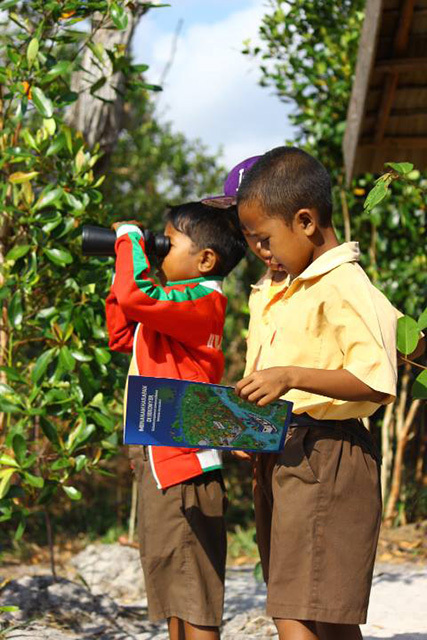 Young students from a village near Lamandau River Wildlife Reserve learn about conservation on a visit to one of our project sites. Our primary focus for the community development projects in Kalimantan has been in the village of Tanjung Harapan – also known as Sekonyer village – on the opposite side of the Sekonyer to Tanjung Puting National Park. The village is near to our reforestation sites at Pesalat and Beguruh within the park, and is where most of our employees are from. Sekonyer village is on the border of Tanjung Puting. Currently, the village is home to about 540 people from many different areas, including Malay, Bugis, Madura and Java. Conflict often rises between villagers and the park authority when it comes to forest protection, because the village has been gradually losing the forest and with it its main economic resources. After centuries of nomadic farming, hunting, fishing, and wood collection, today only 20% of the forest that once belonged to Sekonyer village is left. Environment degradation in Sekonyer village and Tanjung Puting has reached worrying levels. Sekonyer River was once used as the main resource of clean water by the people who live in this area. But recently pollution from the illegal mining upstream has contaminated the river water and its ecosystem with mercury. Meanwhile, there are still wide expanses of open swamp area, critically left to oil palm plantation and mining companies. With the guidance of FNPF, a group of farmers have set up a group, called Sekonyer Lestari, and have committed themselves to protecting the remaining forest and implementing reforestation projects in the surrounding area. Although the group has more than 20 members, limited access to transportation and lack of knowledge to manage nature resources are still substantial challenges that the community faces. Five girls from Tanjung Harapan village who received FNPF’s scholarships, between 2000 and 2005, became the first group of girls from the village to finish high school. Before the program began parents often only sent boys onto further education after primary school. These scholarships have had a positive impact and parents in the village are now more willing to send girls onto further education. FNPF’s conservation education program promotes conservation awareness in younger generations. The program was started in 2000 after we visited high schools in Pangkalan Bun, the capital of Kota Waringin Barat regency – the region where Tanjung Puting is located. Initially run as an extra curricular activity for one high school, the program included lectures and opportunities for students to attend field trips in the park twice a year. The field trips gave the students practical, hands-on knowledge about the conservation of wildlife and their habitat. In 2007, the high school adopted our program as part of their standard curriculum, and all students now receive the conservation education program we designed. For many years, the people in Tanjung Harapan did not believe they could successfully rear cows – many people had tried but the cows kept dying. In 2003, we donated five cows to five farmers and provided them with training in livestock management. A cow can provide a family with a regular milk supply, plus manure for the land – which ties in with our mixed and organic farming program. In 2008, a calf was born in Tanjung Harapan for the first time in their history. This has inspired other villagers to keep cows, and it has led local government and the park authority to donate another 15 cows to the village. Agroforestry shifts farmers from the traditional slash-and-burn farming to a mixed approach. Slash-and-burn farming causes complete clearance of vegetation, which exposes the thin layer of soil to severe erosion and over time makes the land useless for agriculture. Additionally, fires from slash-and-burn farming can cause the underlying peat to ignite, releasing huge volumes of stored carbon into the atmosphere and potentially starting uncontrollable fires that can spread into the national park. Agroforestry and mixed farming, especially if organic, provides farmers with higher and more sustainable incomes. It is also more harmonious with native wildlife and habitat. Agroforestry allows a variety of trees to deliver incomes over different periods of time, whilst underneath a variety of vegetables, preferably organic, can be grown. There has been a constant growth in tourism activity in Tanjung Puting National Park since the 1980s, but unfortunately few benefits have filtered down to the villagers of Tanjung Harapan. In 2006, FNPF began a program teaching ecotourism to a group of people. The program we designed teaches people how to run camping and trekking tours in the national park. We donated tents and camp cooking utensils to the villagers, and built a camping platform at Pesalat, close to our reforestation area. FNPF has been able to secure exclusive rights from the national park authority for the village to run camping tours. This means villagers do not have to compete with established tour operators. The park authority has close control on the activity because they only interface with one single party, and the tour operators have another product to sell to tourists. The villagers now meet tourists who come from all over the world to visit this beautiful and renowned national park. They have begun to recognize the importance of the park and the need to protect the wildlife and habitat inside – not only so they can make a living from tourism, but because of the pride they now have for the area. FNPF has revitalized some of the Malay traditional arts such as the “Gambus” traditional music, “Tirik” traditional dance, “Pencak Silat” traditional martial art, and “Batimung” traditional sauna/spa. We run courses at the village that allow the young generation to learn from the older generation to prevent the arts from being forgotten forever. We also promote this as a tourist attraction, and in 2006 we organized Tanjung Harapan village’s first ever arts festival. The festival included performances in many aspects of Malay culture including cooking, crafts, dancing, sport and spiritual beliefs. This work has been possible thanks to our donors, including the Humane Society International (Australia).